Well...I finally did it. I wasn't sure if I was ready to commit to something so major, but I decided it was time to finally take the plunge. After 24 years, I finally...water marbled. I used colors from my favorite China Glaze collection, Up and Away: Four Leaf Clover, Happy Go Lucky, and Heli-Yum. It was a pretty easy selection, and they go really well together. I used cutepolish's tutorial and it worked wonderfully. Her tips about blowing on the surface of the water and the way she twisted her toothpick to pick up the dried polish on the surface of the water were really clever. I also learned that you need to be careful about where you place your design. I drew designs in different places on the cup, depending on which hand was going to be dipped. Then I wouldn't have to twist my hand into uncomfortable positions to properly dip the nail in the design. So I taped off my fingers, then, using a cotton swab dipped in Vaseline, I coated the areas of skin that were still exposed like the part under my nail and the two corners of my exposed cuticle near the base of my nail. Worked like a charm! Cleanup was much simpler than I thought it would be, and I partially contribute that to my color choices. Black water marbling would probably be a royal pain, but yellow, pink, and teal are much easier. I mainly contribute it to the Vaseline-tape combo I used. I love that endearing little spot on my middle finger. I'll name it Spot. Love the color combo. I love water marbling. I just did one with glitter and it worked. Haven't posted yet but I love it. Absolutely love it!! I love water marbling and combining both taping and Vaselina was very clever! You used a white base, right? Definitely. I tried earlier without white and it's just not ever opaque enough. You can see bits of white peaking through around the edges of the nails. This looks great! I recently marbled with a similar color palette, I love it =]! Awesome mani!! Perfect for summer. 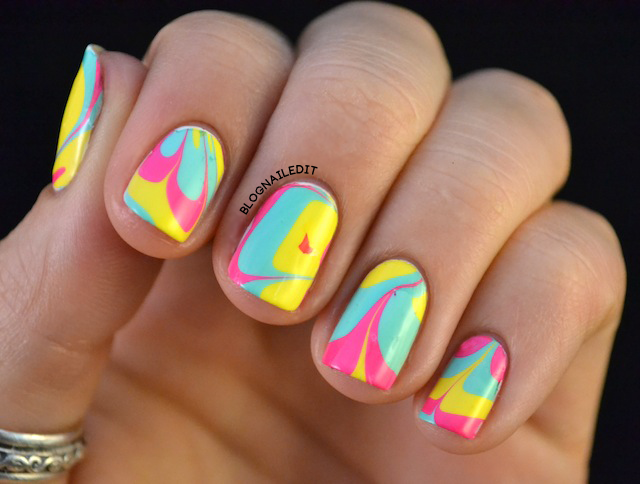 This is your first water marble? It looks awesome! Oooh I like that you used both tape and vaseline! Genius! :D This turned out amazing! It looks great! I have tried a couple of times, but none of those came out as I wanted them to. Brilliant marble!! I'd probably make a huge mess. This looks amazing. The colors look so great together, I love it. Every time I try to water marble I have so many more problems, I'm going to try the vaseline and tape and hope that helps.. and I will definitely be watching that tutorial! Gorgeous! This is so perfect for summer! I can see wearing this on the beach! Wow, this is just gorgeous, perfect summer colors!